Watch the highly anticipated adventures of Magizoologist Newt Scamander and Hogwarts Professor Albus Dumbledore in a truly magical location. 1. These terms and conditions relate to ‘Fantastic Beasts Screenings’ (the “Event”). The Event takes place at Warner Bros. Studio Tour, Studio Tour Drive, Leavesden, Hertfordshire, WD25 7LR (the “Venue”) and the Event will take place on Saturday 17th November 2018, Sunday 18th November 2018 and Monday 19th November 2018. 3. Tickets may only be purchased from the Venue’s website (www.wbstudiotour.co.uk/fantastic-beasts-screenings) or from the Venue’s Visitor Services Team on 0345 084 0900. 4. Tickets shall be available to purchase on Thursday 18th October 2018 from 10am. 5. One hundred and thirty one (131) Tickets in total are available for purchase for each evening of the Event. All Tickets shall be sold on a first-come first-served basis. 6. One (1) adult Ticket (aged 18 years or over only) costs one hundred and forty nine pounds sterling (£149). One (1) Ticket permits one (1) guest to attend the Event. When purchasing tickets, the purchaser must specify whether they wish to attend on either Saturday 17th November 2018, Sunday 18th November 2018 or Monday 19th November 2018. Purchasers may purchase multiple Tickets up to a total maximum of nine (9) Tickets for each evening of the Event. 7. Carer Tickets are also available at a cost of one hundred and eight pounds sterling (£108). Three (3) carer tickets will be held for carers for Saturday 17th November 2018, three (3) carer tickets will be held for carers for Sunday 18th November 2018 and three (3) carer tickets will be held for carers for Monday 19th November 2018. Carer tickets must be purchased over the phone via the Venue’s Visitor Services Team on 0345 084 0900. 10. 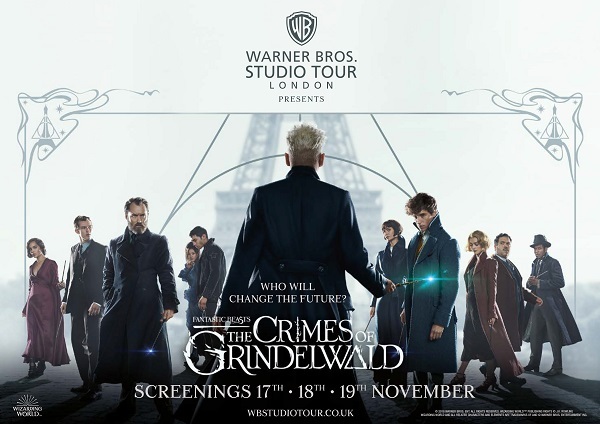 Tickets for the Event are inclusive of everything stated in the event description (www.wbstudiotour.co.uk/fantastic-beasts-screenings) and do not include anything not listed above, including without limitation, accommodation or spending money. 11. Following purchase of Tickets, guests can contact the Venue via email to provide any dietary requirements. Dietary requirements must be communicated by email using the following address: [email protected]. 12. Please note that it is Warner’s policy to refuse to serve alcohol to anyone under the age of eighteen (18). At any time during the Event, Warner staff and security shall have the right to ask guests to produce valid proof of age identification. Warner may refuse to serve alcoholic drinks to any guest who fails to prove that they are eighteen (18) years of age or over and/or who appears to be intoxicated. 13. Guests shall not be allowed to take alcohol outside of the Venue. 14. Warner reserves the right to immediately remove any guest without liability or compensation who fails to comply with the Terms. 15. Personal items left in the Venue’s cloakroom or elsewhere at the Venue are left at owners’ discretion. 16. Warner and its affiliated and/or associated companies, agents, partners and/or other third parties authorised by Warner (together, “Warner Partners”) may create motion pictures, still photographs and/or sound recordings of Guests (“Content”) during the Event at the Venue. 17. By attending the Event, guests confirm that they grant and assign to Warner all rights (including, without limitation, present and future copyright, performance property rights and all neighbouring rights (including so-called authors' rights) in and to the Content and give Warner and/or Warner Partners all consents necessary for the reproduction, exhibition, transmission, broadcast and exploitation of the Content throughout the world in perpetuity and by any and all means and in any and all media now existing or in the future created or discovered, without payment or acknowledgement. The rights shall include, but not be limited to, the right for Warner and/or Warner Partners to use the Content (including, any dubbed, edited, altered and/or adapted versions of the Content) with or independent of other images, for commercial and/or non-commercial purposes in (including, by way of example only, in publications, exhibitions, advertising, promotional and marketing materials and online). Guests also agree to unconditionally and irrevocably waive (or otherwise assign to Warner) the benefits of any provision of law known as "moral rights" in so far as permissible and acknowledge that Warner does not undertake or guarantee that there shall be any use of or other exploitation of the Content. 18. Warner shall have the right to display signs in and around the Venue to remind guests that filming may take place during the Event. 19. A shuttle bus shall be in operation to transfer guests between Watford Junction railway station and the Venue. Transfer via the shuttle bus is a complimentary service for guests. Event tickets need to be shown when boarding the shuttle bus. Buses run every twenty (20) minutes throughout the day and a return shuttle bus will be on standby at the Venue for any guests that need to return to Watford Junction railway station. All guests must have exited the Venue by midnight. Guests using the shuttle bus will be responsible for their own transport to connect with/after drop-off from the shuttle bus. For those guests who do not wish to use the shuttle bus service, those guests shall be responsible for their own transport to and from the Venue. 20. Warner shall take reasonable care to ensure that the Event is as described in the Terms and as advertised to the public. However, events may occur that make some aspects of the Event impractical or inappropriate due to unforeseen circumstances or reasons beyond the control of Warner. In this situation, Warner reserves the right to vary or amend the Event to provide a reasonable alternative at any time and without prior notice to the ticket holder, as a result of which Warner or Warner Partners shall not be held liable.